What is the heaviest piece of a modular safe? On the Titan, the heaviest piece is the door at 92-lbs. On the Super Titan and Super Titan XL, it is the back panel at 140-lbs. On The Super Titan XXL, the heaviest piece is the back panel at 180-lbs. Can I bolt down my modular safe? Yes, there are four (4) pre-drilled holes in the bottom panel of each modular safe. These holes can be used for running wires for accessories, or bolting down the unit. Can I assemble a SnapSafe modular safe while keeping it upright? It is much easier to assemble the unit while it's lying down. 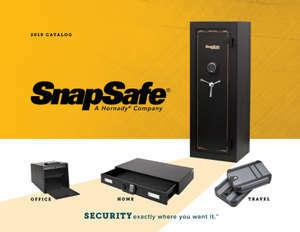 But all SnapSafe modular safes can be assembled upright. How do I reset my padlock? Rotate the shackle 90° counterclockwise and press all the way down. Hold down the shackle and set your own combination by turning dials. Turn the shackle back as normal. The setting is now complete. To reset a new combination, repeat steps 1 through 4 above. How do I set or reset the combination on my TrekLite Lock Box? Begin by opening your TrekLite Lock Box (Item #75241). Move all 4 digits to 0-0-0-0. Make sure all digits are centered on the 0 when opening. Once opened, move the locking lever from A to B on the lock housing. How do I set or reset the combination on my Lock Box? Begin by opening your Combination Lock Box. Move all 3 digits to 0-0-0. Make sure all digits are centered on the 0 when opening. Once opened, move the locking lever from A to B on the lock housing.